Rate this Article Ever since stickers were added to the game, the entire Criminal Case community had been in an uproar. Being a third party fan website, we feel that we’re in the best position to discuss about this issue and come to a conclusion if these stickers are a “Yay” or a “Nay”. Read on to learn more. Ever since Criminal Case has implemented its new Stickers system, the entire Criminal Case community had been in an uproar. The gaming community has been split into 2 main groups – the few who actually supported the change and the majority who disliked the change. Being a third party Criminal Case fan website, we feel that we’re in the best position to discuss about this issue and come to a conclusion if these stickers are a “Yay” or a “Nay”. Not to mention, a part of the Criminal Case community is also outraged and offended that the developers of the game thinks that their player base would enjoy collecting stickers... like some kindergarten kids who are awarded stickers when they are well-behaved. It’s just so childish, and not to mention, pointless! 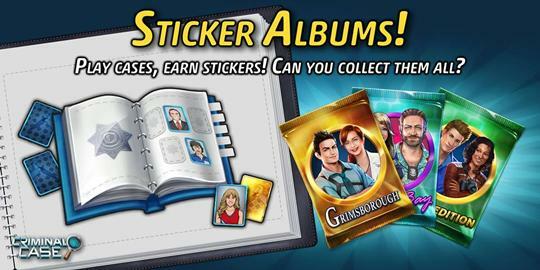 However, do take note that this is not exactly the main point of the discontent that the players of Criminal Case are experiencing, as some players (mainly the younger demographic) are actually delighted to have the chance to collect stickers of their favorite characters.